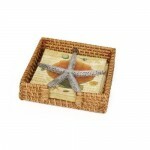 Be more environment-friendly by using the following cute little rattan napkin holders. Certainly, they will add up to some of the things talked about your business, restaurants, hotels, resorts, or simply your home. The picture can speak for itself; simplicity, yet elegance and functionality. 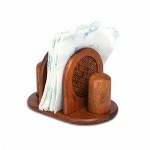 This mini 6 X 6 inches rattan piece is carefully woven to be the best partner for your cocktail napkins. It’s a more organized way to offer or keep table napkins and is perfect for any type of occasion. Also serves as an alternative method to teach your kids early manners of being organized. The added starfish weight looks nice and well serves it purpose. Maximum beauty is obtained when it is filled with colorful printed napkins. Now, we are talking about business. Forget about the plastic and metal napkin holders you got there. Being green is in; and this semi- wood and rattan piece can definitely add that natural look or touch on your business whether it be a classy restaurant, resort, or hotel. This set is made out of quality hardwood and rattan sourced from Asia. Cherry finish was applied to arrive at the tan or rustic look. The salt and pepper shakers found on both sides are made out of wood, easy to use and refill, and is also capable of holding substantial amounts of spices. 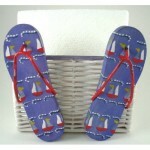 When you’re after a unique and good design, why not try this cute little napkin holder woven from rattan or wicker fibers, painted white, and adorned with miniature beach slippers for added attraction. Its approximate dimension is at 5.25 X 6 X 2.75 inches.